"the building is behind him, but we do not want the building to be very clear and sharp as the main focus we want to have is the CEO. 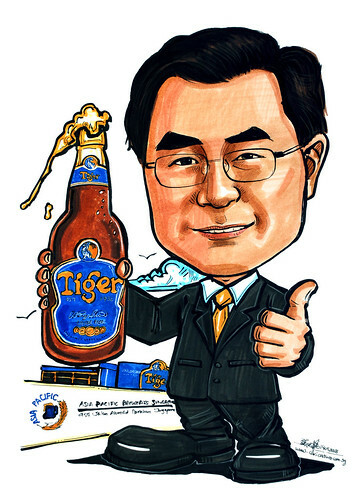 On the left hand side of the ceo, he should be holding a pint, right hand side is with his thumbs up." Can't have building blur, as it is not photo or digitally drawn. They wanted him to be smaller, in relation to the building, in their subsequent emails. Told them that it is a caricature, and the focus is on him. If he's small and the building is big, it will just look like another photo. By the way, this gentleman is not very good and easy to draw, as he doesn't have unique features. Photos provided aren't really ideal, as most part of his face is under the shade, and not distinctive enough. Thus, I have to pay more attention to it, trying to sculpture his facial muscles out from the photo, so that it won't turned out flat too. More like picking out something out of nothing. The client told me that when she brought this framed artwork back to her office, her boss and colleagues like it very much.